Ezekiel's youngest son, Furman Dye, wrote about his father's Revolutionary War record. Marriage Bond: 1778 - Amos Dey and Mary Chamberlain; Monmouth County, New Jersey; Vol D p 332; LDS microfilm 0802937. NOTE: The marriage bond is signed by Amos Dey and 'Esekial Dey'. If another source for Ezekials signature can be found, this would be good evidence of his move from New Jersey. Kenn Stryker-Rodda. "New Jersey Rateables 1778-1780"; 1778-1780; The Genealogical Magazine of New Jersey, V. 50, No. 2 (May 1975); p84 ; Monmouth County NJ Historical Association, Freehold NJ -- Note: Ezekial Dey appears as a single man with horse in 1778. He does not appear in the 1780 listing. Residence-Land: Deed of sale ; 1789 ; Jean Mitchell to Ezekial Dey, dated 22 Mar 1789 ; Westmoreland County. Pennsylvania County Deeds, Book C page 405 ; County Clerk, Westmoreland Co. PA. They moved to Westmorland County (West Newton - blue on the map of Pennsylvania above), Pennsylvania, around 1788 where they had 7 more children. She was born in 1757 and died about 1805 in West Newton, Westmoreland County, Pennsylvania. In traditional stories of the Dye family, Ezekiel had a flour mill in Pennsylvania on Sewickley, Creek, in West Newton, Pennsylvania. Vincent Dye was Ezekiel's uncle. Enoch Dye son of Vincent Dye, was born in Middlesex County New Jersey and died near West Newton, Pennsylvania. His son, Daniel Dye, was born in Sewickley, Pennsylvania" red dot on the map to the right). Enoch and Ezekiel may have migrated to western Pennsylvania at about the same time. This is being researched. His great grandson, James Vincent Dye wrote A Certain Man Went Forth which recounts much of what had been oral tradition within the family. Note that James Vincent Dye argues that Ezekiel and his four brothers may have been in Pennsylvania together prior to their migration into several states. I believe that these were not all Ezekiel's brothers but included sons of Vincent Dye, Ezekiel's uncle from Prince William County, Virginia. Information is available only for Ezekiel's oldest brother John Dye and his youngest brother Amos . This has relevance as at least three of John's relatives married three of Ezekiel's children or grandchildren. One of Amos's grandsons, Henry Dye settled in Vinton County, Ohio. All told, Ezekiel Dye migrated more than 320 miles from Cranbury, New Jersey to Renrock, Ohio. The present day town of Elizabeth, Pennsylvania, is almost directly on the line from Cranbury to Renrock. Thomas Dye was born in Middlesex County, New Jersey and died on January 29, 1865 in Nobel County, Ohio. He married (1) Nancy Agnes Davis about 1805 in Pennsylvania. She was born 19 Jan 1777 in Ireland. Her parents are not known. Nancy died 20 Aug 1820 in Renrock, Morgan Co., Ohio, at the age of 43, and was buried in Old Renrock Cem, Renrock, Ohio. 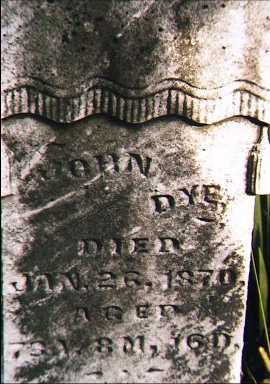 John Dye was born on September 20, 1808 in West Newton, Westmoreland Co., Pennsylvania, died in infancy September 30 1808 in West Newton, Westmoreland Co., Pennsylvania. Benjamin Davis (mother's maiden name) Dye born on November 20, 1810 in Renrock, Morgan Co., Ohio. Benjamin Dye was the first white child born in Brookfield Township. He married Maria Miranda Ross on January 10, 1833 in Ohio. She was born on June 18, 1814 in Ballymena, Ireland. Her parents are not known. Maria died 5 Mar 1892 in Brookfield, Noble Co., Ohio, at the age of 77. "Uncle Benny" was known as a stern man who did not get along with others. He was accused of being an unbeliever. Some of his sons became shop keepers on McConnelsville. Benjamin died on September 14, 1893 in Renrock, Noble Co., Ohio, at the age of 82. Achsah (Axy) Dye, born on June 10, 1814 in Renrock, Morgan Co., Ohio. She married Luther Stansbury on April 18, 1839 in Morgan County, Ohio. He was born 1804 in Maryland. His parents are not known. Thomas married (2) Isabella Bone on March 22, 1821 in Renrock, Morgan County, Ohio. She was born on August 9, 1801 in Pennsylvania. Her parents are not known. Isabella died on March 11, 1852 in Renrock, Noble Co., Ohio, at the age of 50, and was buried in Old Renrock Cem, Renrock, Ohio. Morgan Jones Dye (served in the Civil War, 62nd Ohio, and died in Missouri....Morgan Dye told the story of having dinner with some of the last remaining Indians in Missouri; eating a stew. One of his hosts advised him to 'be sure and dig deep' in the stew pot - 'there's puppy in the bottom'. (Dogs were used as food as well as companions...) He married Martha Jamison and they had 4 children. Mary Jane Dye married charles Parcell. Thomas Dye "also reared a colored boy named Allen Guy "Al", whose descendents settled in or near Zanesville. Rebecca Dye was born 1781 in New Jersey. From Kat Lowrie comes the following. "Rebecca Dye married James Lowrey (Lowrie) in Westmoreland County, PA where they lived in West Newton on a plateau overlooking the Youghiogheny River. This is where William and Elizabeth Lowrey were born, the first two of thirteen children. In 1809, they left with Rebecca's two sisters and brothers-in-laws (Sarah and Anthony Reed and Axey-Axchia and Simeon Martin) and James' father William and traveled by river to near Smith's Ferry - Wellsville, Ohio. William Lowrey died in 1811, James in 1828 and Rebecca in 1867." James and Rebecca had 13 children. Wellsville, Ohio is located on the Ohio River, approximately 80 miles northeast of Renrock, Ohio. He married Nancy Sprague in Ohio. She was born 1796 in Ohio and her parents are not known. Nancy died December 12, 1863 in Renrock, Noble County, Ohio, at the age of 68, and was buried in Old Renrock Cem, Renrock, Ohio. They had 8 children. Hannah Dye married Phillip Swank on September 14, 1847. "Ezekial Dye was known as an 'odd man', had a high saddle, peaked Puritan hat and a stick which he held vertically infront of him as he rode horseback. He would occasionally yell out 'Money Currency' as he rode through the settlement. He was a member of the early Baptist church in Renrock, for which his brother Thomas Dye provided the land." The four Swanks who married the four children of Ezekiel Dye (shown in bold) were the grand children of Ezekiel Dye's second wife Sarah Egbert Paul. Married Arthafaxed (Faxy) Devol in 1808 in Washington County, Ohio (7 children). He was born 1781 in Tiverton, Rhode Island and he died before 1840 in Frookfield, Morgan County, Ohio. Washington County was where John Dey and his sons John and Thomas moved to at about this time. What was the relationship - if any? The name Devol was later used as a first name in the Dye family. Vincent Dye was one of the sons who came to settle in Ohio a year before their father. He built the first brick house in Renrock in 1835, near the top of the hill east of Renrock above the general store run by Silas Thorla.
. She married Simeon Martin on August 15, 1815 in Columbiana County, Ohio. His parents are not known. William Dye lived in the "Grove Community" west of Renrock. It is said he was a distiller of 'herb medicine'. John Dye " He was a prosperous farmer. on the farm later known as the Barnhouse place, or just east of Ezekiel Dye II farm. He was also an enterprising man, building the first water wheel sawmill. Most of his children left the community as they became of age." He married Catherine Sears who died in Renrock in 1870. Catherine Sears was the grand daughter of Captain Robert Sears who "served in the Revolutionary War between 1776 and 1783, as a Captain in the 5th Virginia Regiment. He died in 1812 in Belmont County, Ohio and was buried in the Gibson Chapel Cemetery". Her father was John Manley Sears Sr. "Presumably was living in Belmont County as early as 1815 inasmuch as he married Patty McNabb, in Belmont County on April 17, 1815. He was Viewer for Road Construction in Jul 1819 in Morgan County, Ohio. Dye's Road #1 beginning at the center stake of section 27, township 11, range 11, from Stan Fortices's on Meigs Creek by Ezekiel Dye's and George Dye's to the Guernsey County Line, Joseph Devereau and John Sears were appointed Viewers and Benjamin Thorla [related to Silas Thorla? ], Surveyor. Their report was accepted and the road ordered to be laid out July 1819. He was living in Jul 1819 in Morgan County, Ohio. John Manley Sears, Sr. was involved in the building of Dye Road in 1819 near the Ezekiel Dye farm in Morgan County, Ohio." John Dye and Catherine Sears had 10 children - his oldest child was Ezekiel Dye and the ninth child was Simpson Dye who married Ruth Sears, daughter of John Manley Sears Jr. and Martha Sealock. Thus, her grandfather was John Manley Sears Sr and her husand was her first cousin. Amos Dye was a small child when his family moved from Pennsylvania to Ohio. He lived at Moss Run above Marietta and became a deacon in the church there. He married Sophia Dye 22 Sep 1825 in Morgan County, Ohio. She was born 1805 in Virginia. 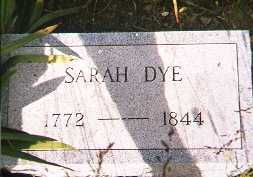 She was the daughter of Samuel Dye (the grandson of Ezekiel's brother John) and Susan Hoff. Sophia died 17 Oct 1868 in Lawrence, Washington Co., Ohio, at the age of 63, and was buried in Moss Run Cem, Lawrence, Ohio. Amos died 6 Jul 1876 in Lawrence, Washington Co., Ohio, at the age of 76, and was buried in Moss Run Cem, Lawrence, Ohio. Jonathan Titus Dye (above) was born on January 26, 1838. A short biography is given in the History of Washington County. He married Abigail E. Jameson in 1862 and he died February 28, 1879 of consumption on the family farm in Lawrence Township. Ezekiel Dye married Sarah Eggbert Paul, a young widow, about 1807 in Westmoreland, PA. She was born in 1781 in Allegeny County, Pennsylvania and died in 1844 in Morgan County, Ohio. Ezekiel Swank was born in 1826 in Manchester,Morgan,Ohio. He married Sarah McBride on March 5, 1851 in Morgan County, Ohio. Rebecca Swank was born on July 14, 1827 in Morgan County, Ohio and she died on November 18, 1896. 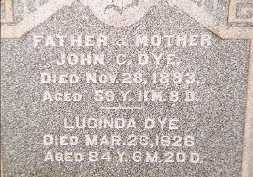 On March 5, 1840 she married Levi Dye, son of Ezekiel Dye who was the son of Ezekiel Dye, Sr. Thus, the granddaughter of Ezekiel Dye's second wife Sarah Egbert Paul married a grandson of Ezekiel Dye. Philip Swank was born on May 3, 1829 in Brookfield, Morgan County, Ohio and died on September 20, 1898 in Nobel County, Ohio. He married Hannah Dye on September 15, 1847 in Morgan County, Ohio. Thus, another granddaughter of Ezekiel Dye's second wife Sarah Egbert Paul married a grandson of Ezekiel Dye. Sarah Swank was born in 1831 in Ohio. She married Vincent Dye, son of Ezekiel Dye, son of Ezekiel Dye. Thus, another granddaughter of Ezekiel Dye's second wife Sarah Egbert Paul married a grandson of Ezekiel Dye. Forman Morgan Swank was born in 1834 in Manchester, Morgan County, Ohio. John Swank was born in 1836 in Manchester, Morgan County, Ohio. Joseph Swank was born on August 18, 1838 in Manchester, Morgan County, Ohio and he died on September 20, 1863. Lucinda Swank was born in 1841 in Brookfield, Morgan County, Ohio and died ____? She married Clark Dye on March 5, 1857 in Noble County, Ohio. Thus, another granddaughter of Ezekiel Dye's second wife Sarah Egbert Paul married a grandson of Ezekiel Dye. Thus, four of Ezekiel Dye's (son of Ezekiel Dye, Sr.) children married four of Harriet Paul's (daughter of Sarah Egbert Paul) children. Jacob Paul married M.E. Harding in 1823 in Morgan County, Ohio. Thus, both children accompanied their mother and step-father to Ohio. In 1806 Ezekiel and his family moved to the Ohio country having a deed from the U.S. government for 2,500 acres of land in the upper reaches of Meigs Creek a second family as indicated below. This second family included Sarah's two children There were so many Dyes in this region that it was known as the Dye Settlement until renamed Renrock. James E Dye was born about 1808 in Morgan County, Ohio. He married Nancy Bell on April 4, 1835 in Morgan County, Ohio. She was born on March 1, 1816 in Ohio. Her parents are not known. Nancy died on March 20, 1895 in Manchester, Morgan County., Ohio, at the age of 79, and was buried in Reinersville Cemetery, Morgan Countuy., Ohio James died on September 21, 1879 in Center, Morgan County., Ohio, and was buried in Reinersville Cem, Morgan County., Ohio. They had five children. Lewis Dye was born in 1813 in Morgan County, Ohio. He married Susan Merwin on January 24, 1833 in Morgan County, Ohio. She was born about 1815 in Ohio. Her parents are not known. Susan died on June 11, 1899 in Brookfield, Noble Co., Ohio. Lewis died on September 8, 1871 in Brookfield, Noble Co., Ohio, at the age of 58. They had four children. She married Samuel Dye 16 Dec 1830 in Morgan County, Ohio. He was born 24 Sep 1806 in Fearing, Washington Co., Ohio. He was the son of John Dye (the grandson of John Dye, Sr. and thus the grandnephew of Ezekiel Dye, Sr.) and Hannah Hoff. Samuel Dye spent most of his early life clearing the forest and helping to support his brothers and sisters, as his father was of a delicate constitution and unable to withstand the most ardurous duties of pioneer life. Despite limited education, he held the office of justice of the peace for 12 years, and was noted for his just and impartial disposition. He has been a prominent member of the Baptist church for 40 years, serving as a deacon for 30 years. In politics, he is a Republican, and has worked hard for the success of that party since its infancy. Samuel Dye was esteemed for his honesty, and was held to be one of the kindest and most affectionate of men. In the biographical sketch of her husband, Samuel Dye; Lucinda is described as a woman of most generous impulses, and a most affectionate wife and mother. Like Lucretia of old, her hands were never idle, and such was her devotion to her husband and children that however ardurous her domestic duties her words of cheer and comfort and her helping hand were always unreserved. Married (1) Mehitable Kirkpatric (3 children) and (2) Miranda Ross. She married John Moore 8 June 1834 in Morgan County, Ohio. He was born about 1807 in Ohio. His parents are not known. They lived on the site of the original Ezekiel Dye, S. home south of Blanchard Creek, a tributary of Dyes Fork. John died 11 Mar 1882 in Brookfield, Noble Co., Ohio, and was buried in Old Renrock Cem, Renrock, Ohio. Silas Thorla notes that Charlotte died an untimely death when a derrick, used for butchering beef, broke and fatally injured her. Thorla paints the following picture of John Moore. "As we recall John Moore he filled the bill of an aristocratic country gentleman farmer. His corpulent body, his sonorous voice, heavy gray beard, wide open expressive countenance haunts us still. He never went about looking slouchy or slovenly. In a crowd you might well as try to hide an earthquake as to conceal this man's presence and prestige. He built the first two story frame house in the community that was so rickety that it had to be supported by poles." He married Lucy McElroy 15 April 1847 in Morgan County, Ohio. She was born 1829 in Ohio. Her parents are not known. Lucy died 1918 in Renrock, Noble Co., Ohio, at the age of 89, and was buried in Renrock M. P. Cm, Renrock, Ohio. Furman Dye started the Renrock General Store which was later purchased by Samuel J. Paxton (my great great grandfather). Silas Thola provided some additional information about Furman Dye when he died. Jonathan Paul sent me the photograph of Furman Dye. The handwritten caption on the back of the photo says: "Furman Dye - Youngest half brother of Grandfather Paul, Great Grandmother Paul married Dye after great grandfather was killed. These people lived in McConnelsville Ohio." The writer was Edna Paul Ranier, granddaughter of Jacob Paul who is referred to as "Grandfather" in the caption. "Great Grandfather" was Joseph Paul, first husband of Sarah Egbert Paul Dye who is referred to as "Great Grandmother". There was no information on the identity of the two women in the photograph. Recently Jen Godwin identified Lucy McElroy Dye (wife of Furman) as the lady on the right. The woman on the left is her sister, Henrietta McElroy McNutt. On February 4, 1870, Furman wrote a letter to Nancy Underwood Dye Combs (daughter of Thomas Dye and Isabella Bone) and her husband Alexander Combs who were living at Denver, Missouri. The letter contains a lot of information about who was doing what and with whom. It also has a rather graphic statement about the difference between living in Ohio and living in Missouri. Thanks to David Wright for a copy of the letter. 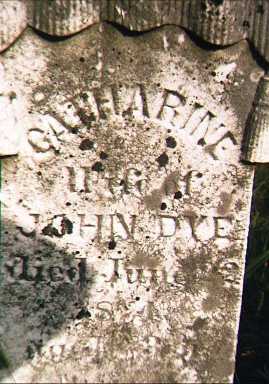 David's ancestor Catherine Sears was the wife of the "brother John Dye" whose recent death is noted in the first paragraph of the letter. A copy of his will is available. 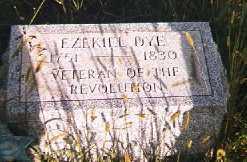 Ezekiel Dye Sr., had 10 sons who lived to be at least 20; their average age was a remarkable 72 years. He had at least 113 grandchildren. Nearly 152 years is covered by the time from Ezekiel's birth to the death of his youngest son Furman.